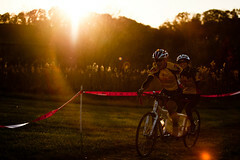 NCVC broke the mold and started from scratch on this year’s edition of Ed Sander Memorial Cyclocross. A bold move, especially when you have one of the longest running and most popular cyclocross events in the Mid-Atlantic. I’m sure there were those that raced who missed the long gravel stretches but they were few and far between. The new course, with big flowy turns, a nice drop in and a fast ride through the lily ponds, still demanded lots of power but was overall a joy to ride. And the long uphill finishing stretch? Brutal at the end of any race. Even more so if you’re in a dog fight. The video features four races from the day’s MABRAcross Super 8 Series festivities, including the tandem. The aquatic park combined with the time change made for some really nice shooting conditions by the end of the day. Thanks for watching and we will see you this weekend at Schooley Mill. Next Next post: Cyclocross. Sport of the Future.